Following many years of producing organic and biodynamic wines, "Papakonstantinou´s vineyard" has diversified into producing organic and biodynamic vinegar. Since 2012 we have been producing top quality white and red vinegar, exclusively extracted from our produced wines. All of our products are certified by the organization “Bio Hellas” and by the German organization “Demeter” (which specializes in biodynamic farming). 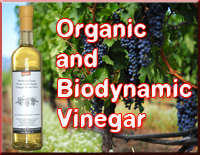 It is worth mentioning that we are the sole producers of biodynamic vinegar in Greece. Packaging for the food industry.